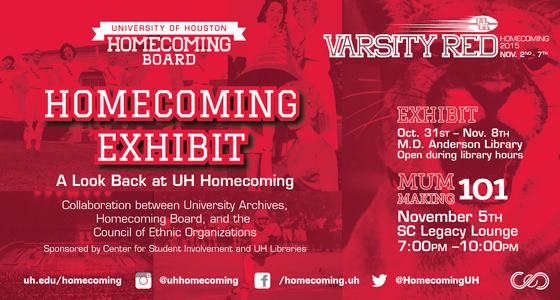 Homecoming Week is upon the University of Houston, and the University Archives and Special Collections are joining in the celebration. 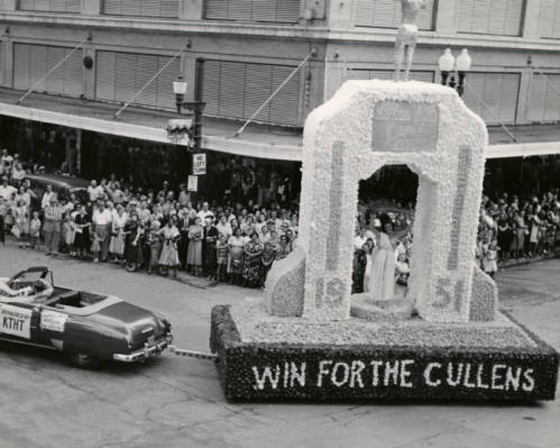 Last year, you may recall, the archives worked with other library partners to launch a virtual exhibit, UH Homecoming through the Years. This year, the Homecoming Board, Council of Ethnic Organizations, and University Archives have partnered to produce a collaborative Homecoming exhibit entitled “A Look Back at UH Homecoming.” Representatives from these groups have been meeting for months, brainstorming ideas, coordinating research in the archives, and planning for the exhibit and related events. University Archives staff have provided guidance on using the archives and shared resources on the history of homecoming and the University. Meanwhile, the students brought their energy and vision of a Varsity Red Homecoming and selected the materials and stories they wanted to highlight in the exhibit. Homecoming marked a perfect opportunity for this sort of collaboration, and the new exhibit looks great! 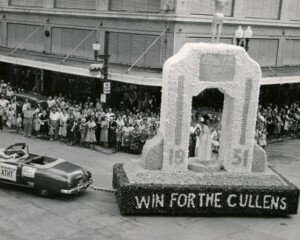 The exhibit focuses on the early days of homecoming at UH, and covers events ranging from the first Homecoming in 1946 to the crowning of UH’s first African-American homecoming queen in 1968. 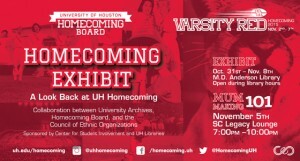 In keeping with the Homecoming Board’s theme for the year, the exhibit seeks to inform students about the origins of homecoming at UH, instill Cougar pride, and highlight some of the traditions that have been a part of this campus celebration over the years. The exhibit is currently on display in front of Special Collections on the second floor of the M.D. Anderson Library. It will be there throughout Homecoming Week, with one very special exception. As a part of the week’s festivities, the exhibit will be hitting the road! Making a rare trip outside of Special Collections, these University Archives materials included in the exhibit will be featured during the Homecoming Board’s Mum-Making 101 event, which takes place Legacy Lounge in the Student Center on Thursday, November 5. The artifacts will be on display there from 7-8pm, while the event goes on till 10pm. The next day, the exhibit will pop back up in front of Special Collections, where it will remain on display through November 13th. The following comes to us courtesy of Julia Taylor, Graduate Fellow of the Carey C. Shuart Women’s Archive and Research Collection. While Friday’s SCOTUS ruling on marriage equality marks a milestone in the struggle for LGBTQIAP rights, Special Collections’ booth at this year’s Houston Pride documented the genealogy of LGBT activists who set the stage for this historic win. 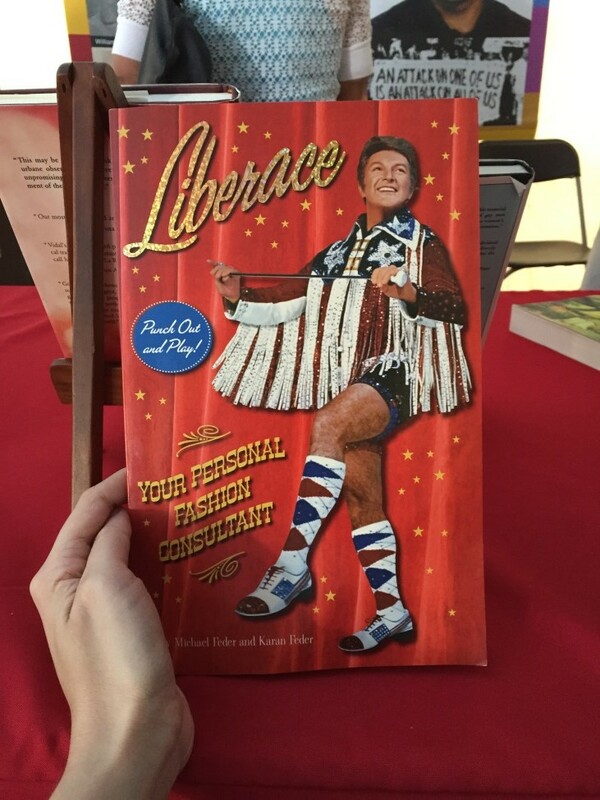 Edward Lukasek’s copy of Liberace: Your Personal Fashion Consultant, a book of Liberace paper dolls emblazoned with life mottos, was a crowd-pleasing favorite. This year’s Pride festival and parade took place in downtown Houston instead of the usual shady Montrose locale, making the air-conditioned atmosphere of the LGBT History tent a welcome respite from the Texas heat. 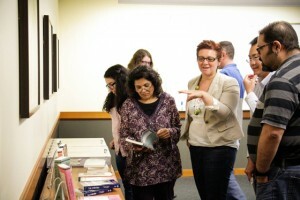 Special Collections proudly exhibited rare books and artifacts from the Edward Lukasek Gay Studies Collection and the Norma Lee Gay Studies Collection, as well as papers and ephemera from the Houston Area NOW Collection, the Debra Danburg Papers, and the Kanellos Latino Literary Movement Book Collection. Library staff and volunteers stood by to answer questions and show support as families, couples, and friends perused the display of historical and literary materials. The LGBT history tent, which was sponsored by AT&T, also housed exhibits from Rice University Special Collections, the Botts Collections of Lesbian, Gay, Bisexual, and Transgender History, the Houston Public Library, and the Old Lesbian Oral Herstory Project. To learn more about the history of Houston Pride, visit their website. Last month Arte Público Press and the University of Houston Special Collections came together to celebrate María Cristina Mena (1893-1965) in an event that honored her writings and highlighted the gift of her papers to our Hispanic Collections. Mena was an author probably most known for her children’s books and short stories, including some published in The Century Magazine and American Magazine from 1913 to 1916 (though she continued to write and publish up until just before her passing in 1965). The event was held in Special Collections at the MD Anderson Library on campus. Honored guests Amy Doherty Mohr, PhD of Amerika-Institut at Ludwig-Maximilians-Universität Munich; José Aranda, PhD of Rice University, Department of English; and Carolina A. Villarroel, PhD of Arte Público Press and the Recovering the U.S. Hispanic Literary Heritage Project, served as panelists for the event which was moderated by Lisa Cruces, Archivist for our Hispanic Collections. Hispanic Collections Archivist Lisa Cruces highlights the María Cristina Mena Papers for the cameras of Houston Public Media. Our thanks to all who helped make the event a success. The María Cristina Mena Papers, part of our larger Hispanic Collections, are available for research in the University of Houston Special Collections Reading Room. 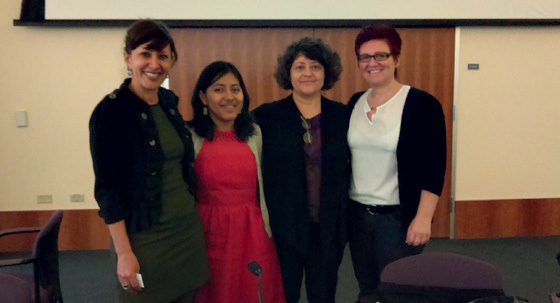 The University of Houston recently hosted Dr. Maria Cotera of the University of Michigan and her talk, “Decolonizing the Archive: Chicana por mi Raza and the Challenge of Digital Humanities.” Dr. Cotera’s talk focused on her work with Chicana por mi Raza, a public humanities project centered on the collection and digital preservation of archival materials, ephemera, and oral histories that document the development of Chicana feminist thought during the civil rights era. 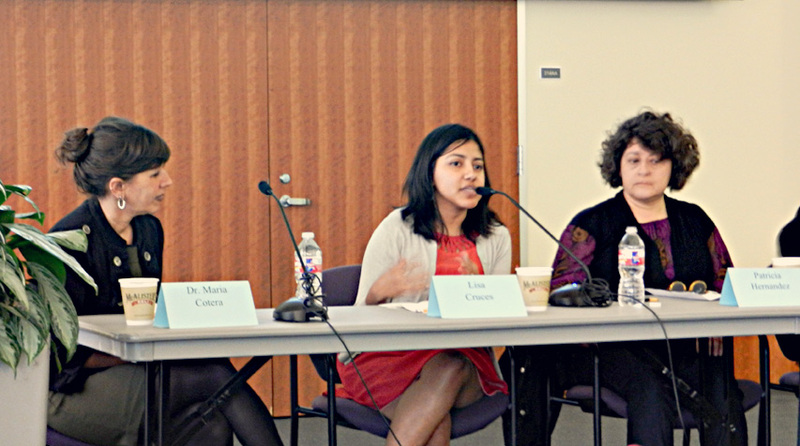 A panel discussion, “Pushing Back: Chicana, Latina, Hispanic Women Preserving our Narratives,” followed Cotera’s talk and featured the founder of Studio One Archive Resource, Patricia Hernandez, Director of Research for Arte Público Press, Dr. Carolina Villaroel, and the first Hispanic Collections Archivist at the University of Houston, our own Lisa Cruces. Sponsored by a number of organizations on and off campus, Dr. Cotera’s talk was broadly attended and included students, staff, and faculty from UH as well as local universities and high schools. 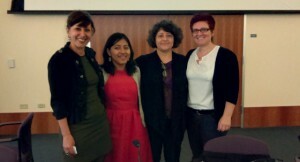 The “digital turn,” Dr. Cotera argues, has allowed for a certain de-centering of authority in the work of scholarly research and the Chicana por mi Raza project establishes a collaborative venue providing broad-based public access to oral histories, correspondence, and out-of-print publications for scholarly research in and out of the classroom. Her work with Chicana por mi Raza represents a challenge to the pedagogy and influence of archival politics, prejudices, and patriarchal legacy of the existing structure. The result is a democratization of the archives and an engagement with communities that have been underrepresented in more traditional research models. The panel that followed provided attendees an opportunity to ask questions and hear from women in the field with a variety of traditional and non-traditional archival backgrounds address the subtleties, nuance, and challenges of preserving the historical narratives in this new landscape. 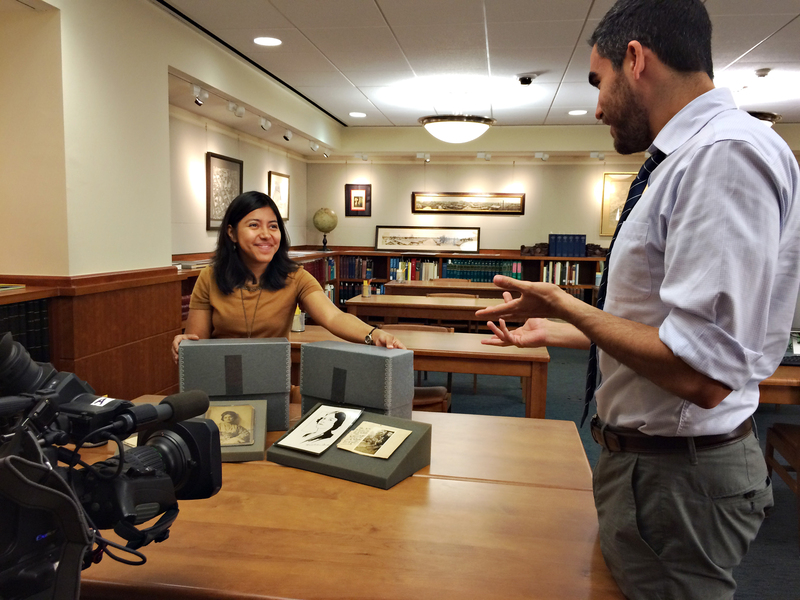 As Archivist for the Hispanic Collections here at UH, Cruces certainly has faith in aspects of the traditional archival models, but pointed out that Cotera’s work necessitates the bringing together of multiple vested interests and provides a great opportunity to partner with members of the community outside of the traditional institutional walls. In turn, this work allows a means of introduction to the archives while also allowing participants to look critically as to how historical memory is collected. If you are interested in the collection and preservation of that historical memory, we encourage you to visit our Hispanic Collections at the University of Houston Special Collections.